Our Church Food Pantry operates on Mondays from 10:00am until 12:00noon. Jars of food and personal hygiene items always appreciated. Between five to thirty families use this mission each week. We need help picking up food from Manna Foodbank in Asheville on Thursday mornings or help putting the food up when it arrives at the church on Thursday afternoons. We also collect food on Monday and Friday mornings from Publix in Waynesville. Thanks to the Manna Foodbank and Publix for their donations. Call the church office to help. The Shepherd’s Table meal offers a free dinner to anyone on Mondays from 5:30 pm until 7:00 pm In our Fellowship Hall. We serve families, seniors, and singles in need of a good meal and fellowship. During the summer we have up to 120 people join us. 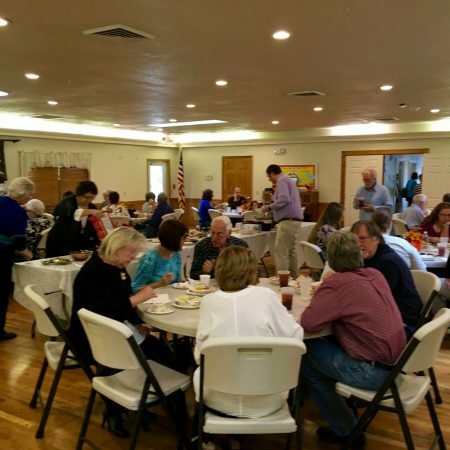 Members and guests share a good meal and meet their neighbors. Financial gifts may be given, but not required. We love help greeting, cooking, serving, and cleaning. Call the church office to help. On Thanksgiving Day, Maggie Valley churches serve a Community Thanksgiving Meal for those who would like to spend the day with their church family and friends. The five area churches provide this meal from 11:00 am until 2:00 pm.